Webcam from the weather station of La Casetta bio in Villa Santi di Massignano. The webcam takes pictures of Val Menocchia. 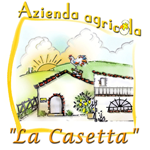 By subscribing to our mailing list you will receive only emails regarding the La Casetta farm, with discounts and promotions, promoted activities, presentation of new products and technical notices regarding this site. You will be free to cancel yourself at any time and independently. Your email will be for the exclusive use of La Casetta Bio. We guarantee that your name will not be given to third parties.